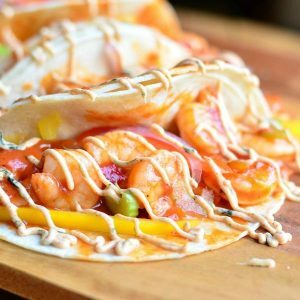 Delicious, easy Shrimp Tacos made with Louisiana Creole sauce and packed with creole must have veggies, bell peppers, onion and celery. These delightful tacos are also topped with an easy Homemade Cajun Mayo. 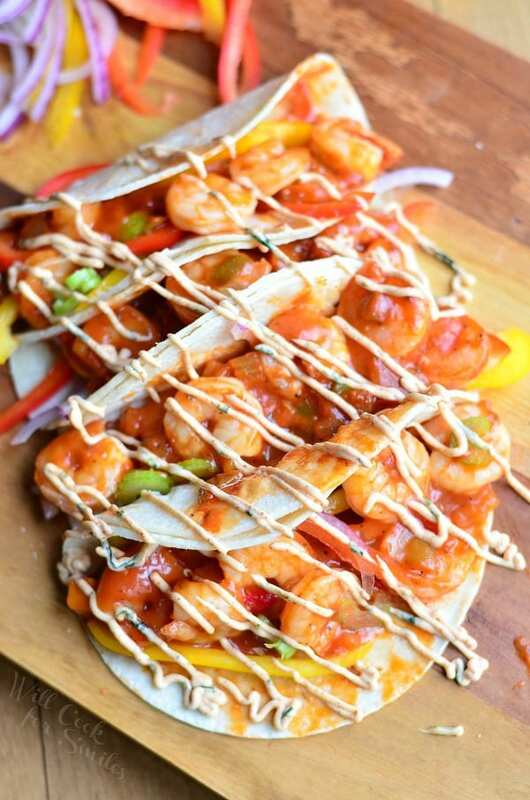 These light, fresh, crispy shrimp tacos would make a perfect fast lunch and even dinner. I love fresh crispy veggies here and the spice from Creole seasoning. And, a perfect touch of creaminess is added with homemade Cajun Mayo. When making this mayo, you can either use ready Cajun spice or make your own blend. 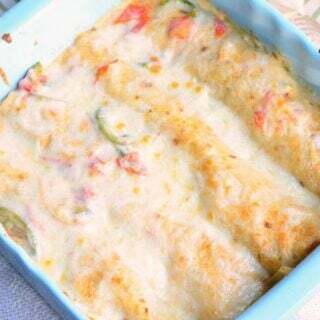 I made these tacos with the traditional veggies found in Louisiana Creole cuisine. The basic three are bell peppers, red onion and celery. You can play around with other veggies if you prefer. 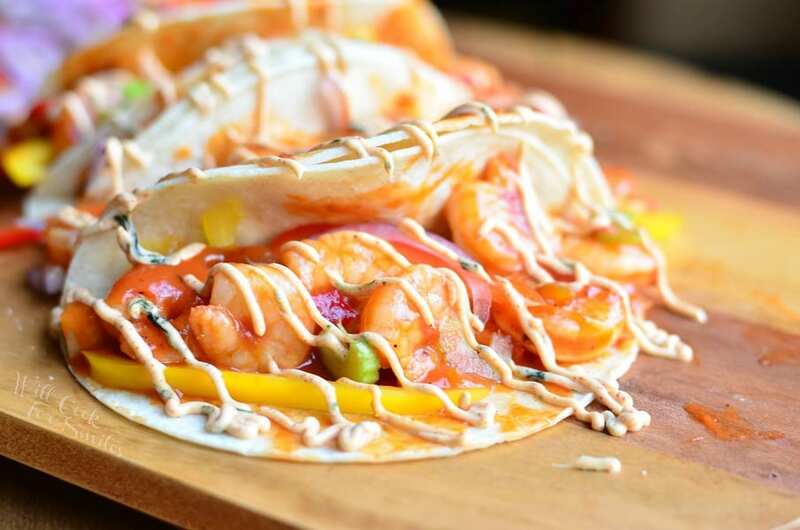 That’s the great part about these tacos, they are totally customizable with different veggies. 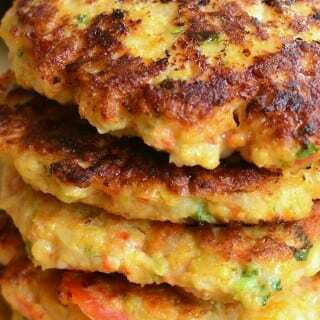 You can even add some rice on the bottom to make them a little more dinner-friendly. If you’re brave, try adding a little more heat with Louisiana hot sauce. 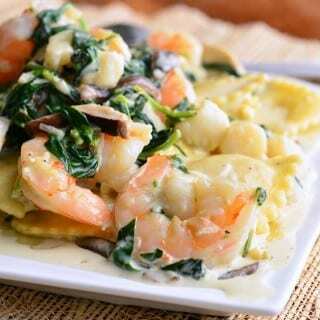 When cooking these shrimp, I used Louisiana Creole flavor of Imagine® Organic Culinary Simmer Sauce. 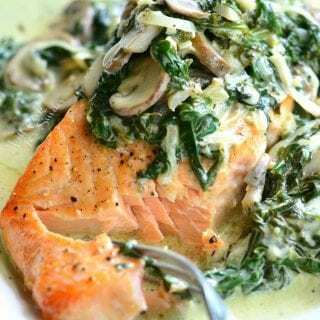 I tried one of these sauces when I made Easy Thai Coconut Curry Chicken and Vegetables and it was lovely and very convenient for a busy weekday. 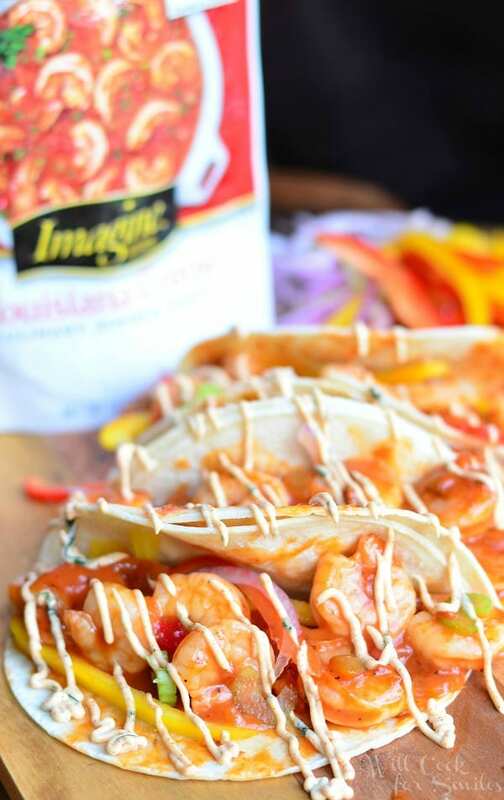 It was so simple to just simmer this sauce with shrimp and then add it to tacos. The whole dish took me 15 minutes to prepare. 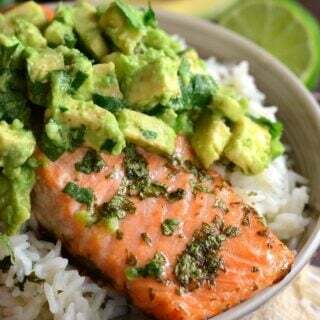 If you will be making the dinner version with rice, it might take you a little longer, just to cook rice as well. These Imagine® simmer sauces come in three other flavors and I can’t wait to try them all. It comes in Portobello Red Wine, Latin Veracruz and Thai Coconut Curry. They are Certified Organic, have no genetically engineered ingredients, no preservatives or artificial ingredients, and no added MSG. These sauces are also gluten free and vegetarian. 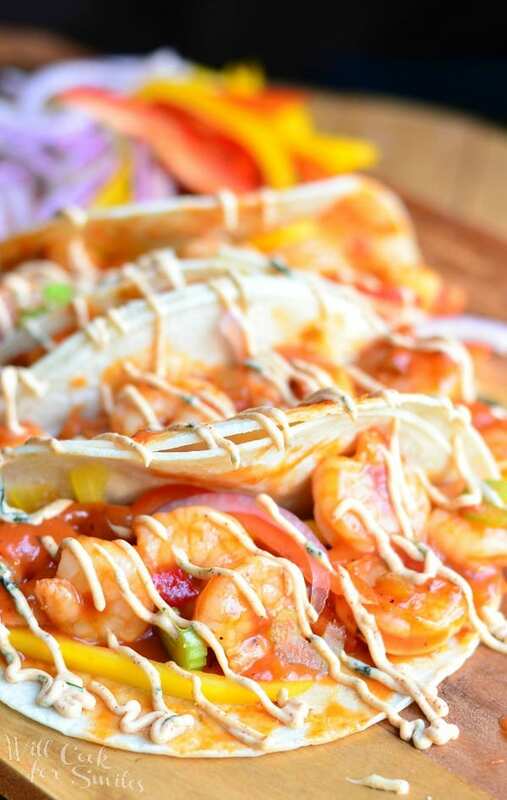 Shrimp Tacos made with Louisiana Creole sauce and packed with creole must have veggies, bell peppers, onion and celery. These delightful tacos are also topped with an easy Homemade Cajun Mayo. Preheat a saute pan over medium heat with a little bit of oil and add raw shrimp. 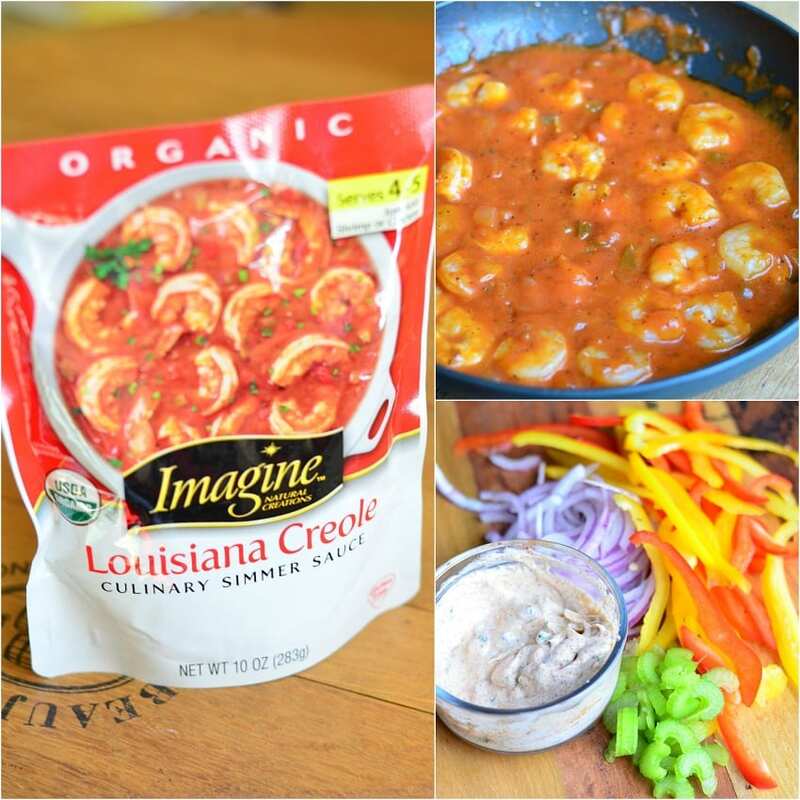 Add Louisiana Creole Imagine Imagine® Organic Culinary Simmer Sauce and salt to taste. Simmer just until shrimp turns pink on the bottom and flip them. Cook until shrimp turns pink and take off heat. Transfer shrimp with sauce into a serving bowl so everyone can build their own tacos. Slice bell peppers, onion and celery as thin as you can. Lay it out on a serving tray. Warm up tortillas and cover until ready to use. 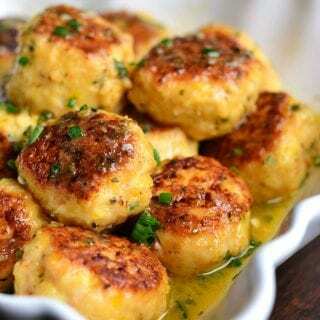 In a small mixing bowl, combine mayo, Cajun seasoning, parsley and salt. Mix well until all combined and smooth. Serve right away, while shrimp is warm. Imagine® is having a Facebook contest! Contest will take place on the Imagine® Facebook page (Mid-October through November).